Reader Elizabeth sent me a link to the Etsy store that has this pattern — it's called, unsurprisingly, patternshop. Some nice stuff, but what really caught my eye was this dress. I love the lines of it. Despite the fact that I usually wear big ol' skirts and vintage-y details, I have a secret hidden Calvin-Kleinesque minimalist buried under the novelty prints, hoping someday to escape into something like this. Of course, since my inner minimalist almost never gets to come out, she'll continue to think about this dress while reading philosophy and listening to aleatory music in her cell, hidden behind the bolts of silly fabric. She doesn't mind. She likes the quiet. I looked at this image and mentally said, “crotch pockets.” I’ll leave it up to you to decide if this was a commentary on the dress, or on the juvenile state of my brain. how much do i love that you refer to “aleatory music?” hahah. Spectator pumps. 🙂 that dress is totally made for ’em. Not everyone networks on planes — Some people… just are, for better or worse. Thinking of making any kind of impression on a stranger doesn’t come into their minds. Kinda fascinating, really, I amuse myself by watching what the bikers across the street consider uniform. Maybe a wedge heel, minimal detailing? In black, or possibly yellow or red (I love yellow or red with gray). Or tall, elegant, basic black boots, though it’s hard to think about those in late June.Crotch pockets – hee hee. But I do like that design. But if you put your wallet in one of the pockets, you’d get a weird bulge.Otherwise, pockets in dresses ftw! I wonder about how those pockets behave when one sits down? If I was making such a dress I might introduce and invisible zipper or something to make sure the pockets behave themselves. Wonder what a good look for peeping out of the pocket lining fabric would be? The same thing I’d line the jacket with I suppose? Why would a person want pockets in area where they would draw attention to possible figure flaws? IMO, those pockets are perfectly placed to give the wearer a bulging belly, whether she started the day with one or not. And that’s before actually putting anything in the pockets. 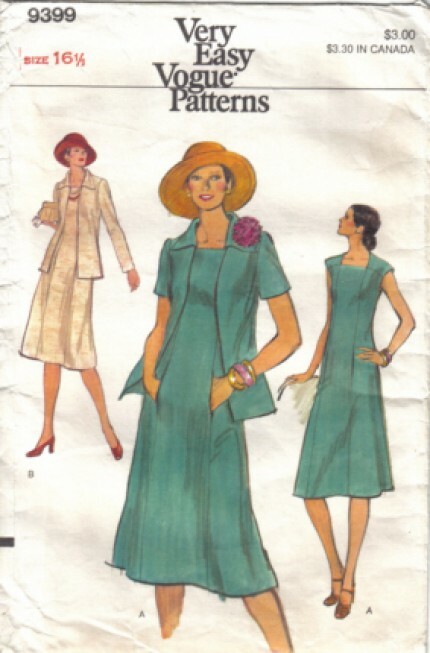 I would strongly suggest making this one up with nice boring ordinary seams over the belly, and putting pockets in the side of the dress, where the skirt flares out.I have to admit, that I don’t find the posture possibilities particularly attractive. It’s easy to look casual and cool with one hand stuck in a side pocket; however, with one hand? Both hands? stuck inside the belly pocket, it could make the least curious onlooker wonder what exactly was happening. I don’t think I’d want to encourage such speculation! I’m with the pocket-placement naysayers here – I would set patch pockets into the side front panels with the top cut on a slash (higher in the front than the back). if this were Erin’s gunmetal dress with minimal black piping, I’d be mighty tempted to run the piping along the top of the pockets, too. I was just popping on to ask if anyone ever had luck with those kind of pockets. I put them in a 6 gore skirt, thinking I’d eliminate the bulging problem that side seam pockets can get – boy was I wrong! The pocket would pop out while I was walking even, let alone sitting down. Little snaps in the centres of the opennings didn’t help either. It ended up getting sewn shut, and that skirt is now sadly pocketless. I agree with Danika. While patch pockets at the hip line between the princess seam and side seam may widen the hips, the width is balanced by the width of the extended cap at the shoulders. Yup, I’d have to pipe the pockets too. I too have a secret inner minimalist! Mine is very attracted to Japanese-influenced designs, loves a crisp linen, asymmetry, handwoven scarfs, and modern wooden jewelry. But for now, I’m more likely wear printed tee shirts and loud skirts. I recently whipped up a skirt with the same pocket placement; I think in a nice sturdy fabric, these pockets would be okay. My skirt pockets do not behave too well, as I used a gauzy cotton in a voluminous cut. I’ll try to remember to scan the pattern and send you a pic (Erin, it has a midriff band and a big, obi-like sash as well!). The dress has nice style lines, but no crotch pockets please! I don’t understand the mentality that wants a woman looking like she is scratching her privates. Or with things in the pockets, growing more private things. I saw lots of pockets on dresses at TJ MAXX and very pretty full skirts at Target.